Wood Fen Lodge can be found 5 miles from Ely’s towering cathedral – the ‘Ship of the Fens’ – We have a fully licensed bar and lounge, and guests are welcome to enjoy our peaceful environment by enjoying our spacious gardens and terraced area. 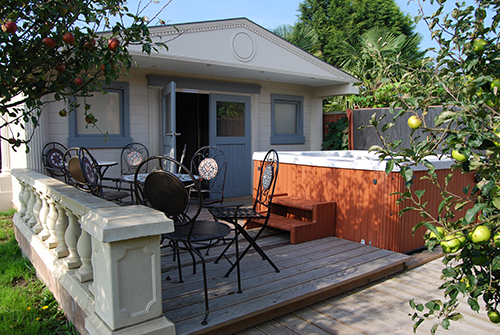 Wood Fen Lodge is much more than other guest houses as it is also the centre of an holistic spa. It means that you can also treat yourself to a hair or beauty treatment, you can ease away your stresses with a relaxing holistic therapy, or just lay back and enjoy our new Greek Thermae Spa Centre at a small extra charge. 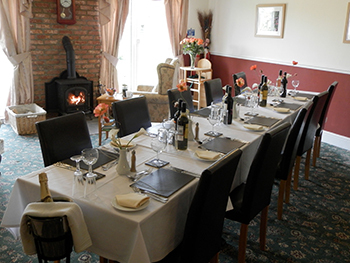 Our guest dining room overlooks extensive gardens with a smallholding and terraced area. Individual tables provide a comfortable eating experience overlooking the grounds.The “Baize Bar and Lounge” lead off the dining room providing guests with a cosy area to relax and enjoy a drink. You can enjoy breakfast with a selection of teas & coffee, fruit juices, cereals, yoghurt, toast, preserves , as well, of course, as the hearty full English. Why not order a smoked salmon and champagne breakfast for that special occasion, and we can also provide chocolates and flowers too. All dietary requirements can be catered for – just let us know at the time of booking.